The interest rate differential between fixed-rate and adjustable-rate mortgages continues to widen and has now reached historic levels. There’s never been a better time to lock an ARM. According to Freddie Mac’s weekly Primary Mortgage Market Survey, homeowners in Brentwood who lock their mortgage rate today will save 129 basis points on rate, on average, by choosing a 5-year ARM as their mortgage product as compared to a 30-year fixed rate loan. The average 30-year fixed rate is 4.51%. The average 5-year ARM rate is 3.22%. It’s the biggest interest rate spread between fixed-rate and adjustable-rate mortgage rates in Freddie Mac’s recorded history; a gap which is the result, in part, of the 5-year ARM dropping to all-time lows this week. 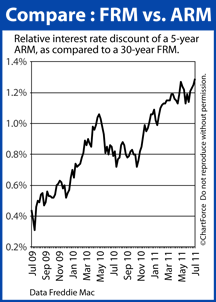 Rates for the 5-year ARM are even lower than during last year’s historic Refi Boom. Putting today’s “spread” in action against a hypothetical $250,000 loan size, a homeowner that chooses an ARM over a fixed-rate loan would save $184.30 monthly, and would have $500 fewer closing costs. That’s a 5-year savings of $11,558 — nearly triple what you would have saved just 2 years ago. The main reason why today’s adjustable-rate mortgages are priced so aggressively relative to comparable fixed-rate loans is that Wall Street expects the economy to drag for the next several quarters, after which it expects an acceleration. ARMs tend to reflect short-term expectations for the U.S. economy which is why short-term mortgage rates are dropping. Fixed products, by contrast, take a longer view and expectations for an economic rebound are pulling fixed-rate mortgage rates up. For now, mortgage applicants can exploit the difference — especially those who plan to move within the next 5 years — but adjustable-rate mortgages aren’t right for everyone. ARMs carry particular risks about which you should be aware before locking. Before you choose an ARM, therefore, talk it through with your loan officer.